Pregnancy Help 3 car seats which to use for my baby ? Dear Cheeky Chums I’m pregnant and people keep giving me things for my new baby which car seat is best for baby, these are second hand and I’m not that keen on a second hand one.One is from a charity shop off a neighbour another my friend got free off Facebook and the other my step dad got it for me off the car boot sale what shall I do? Cheeky Chums can only recommend safe products for babies. The problem with second hand car seats is you never are really sure they haven’t already been involved with a car accident of crash. There is no doubt that a good quality car seat is one of the most important purchases the parent of an infant or toddler can make. A properly installed car seat can be a real life saver in a crash. In addition, a car seat can keep the baby comfortable and happy on those long road trips. Unfortunately, there are some common mistakes parents make when buying these important safety items. Listed below are some of the most frequently seen mistakes made when buying and installing a car seat. 1.Buying a car seat that is difficult to install – Proper installation is the most important part of buying a good car seat. Inspections of car seats reveal that the majority of car seats are installed improperly. Car seats that come with incomplete or poorly worded instructions, or those that are overly complicated to install, can be dangerous. 2.Buying a car seat that does not properly fit your vehicle. Most car seats are designed to fit most models of newer cars, but owners of older or more exotic cars may have problems fitting car seats properly. If you are unsure if the seat you chose will fit your car, be sure to check with the auto dealer. 3.Not looking for the seal of the Federal Motor Vehicle Safety Standard. 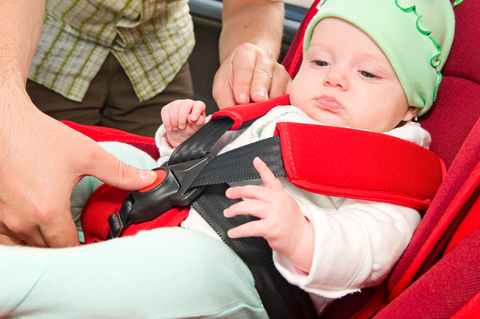 Parents should only buy car seats that meet or exceed this federal standard. 4.Buying a car seat that is too small for your baby – All car seats carry a maximum height and weight rating. Be sure to buy a car seat that provide room to grow. 5.Choosing a car seat that is not compatible with your car’s seat belt. Not all car seats are compatible with all styles of seat belts. If you are unsure what type of car seat you need, be sure to consult with the manufacturer. 6.Not ensuring that the car seat fits the baby properly. Particularly with larger car seats, a small baby could accidentally slip out of the seat. It is important that infants one year of age and younger ride only in a rear facing car seat. Only after the baby is older than one year and weighs between 20 or 40 pounds should he or she be switched to a front facing seat. 7.Not checking for safety recalls. There are a number of safety recalls on car seats every year, and it is important to check for recalls on the model car seat you are considering. 8.Not choosing the fabric carefully – It is important to choose a fabric that is machine washable. In addition, a cloth upholstered seat is often more comfortable for the baby. 9.Not buying a car seat as part of a travel system – It is possible to buy a car seat that is part of a three part travel system. That means that the car seat, infant carrier and stroller are all integrated into one handy unit. This combination is often a more convenient and cost effective solution than buying the items separately.